I don't think I've posted progress on Hamworthy before - certainly not on this version of RMweb. Hamworthy is Hampton Court MRS's new finescale layout. It is prototype location, Hamworthy, and the trackplan is as it was shortly after it's electrification as part of the Wessex Electric scheme in 1987/88. 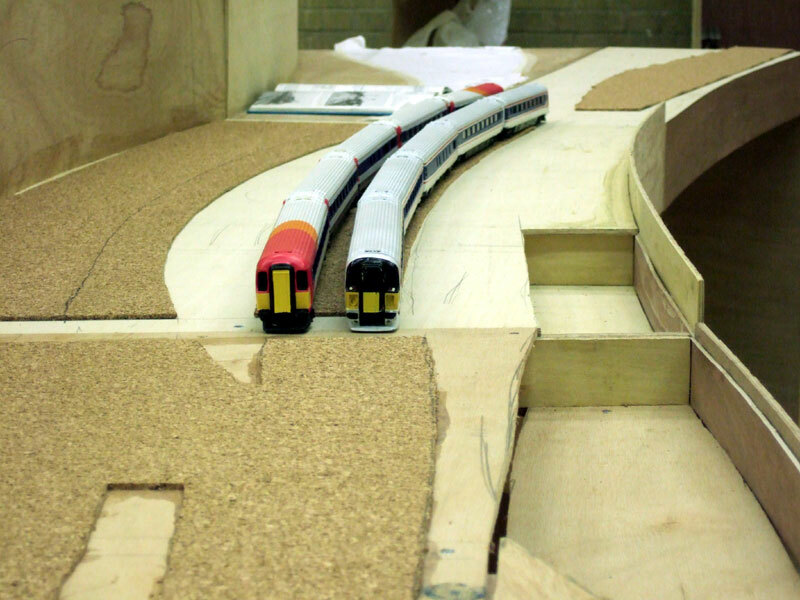 We have had to shorten some of the sidings at both ends, but the curvature is pretty much as the prototype. In this view we are looking toward Poole, Bournemouth and London. These next photos show the current extent of work. Showing the platforms under construction. The Wessex electric is Hurst ends on Jouef mkIII's and it's being used to gauge the platforms. 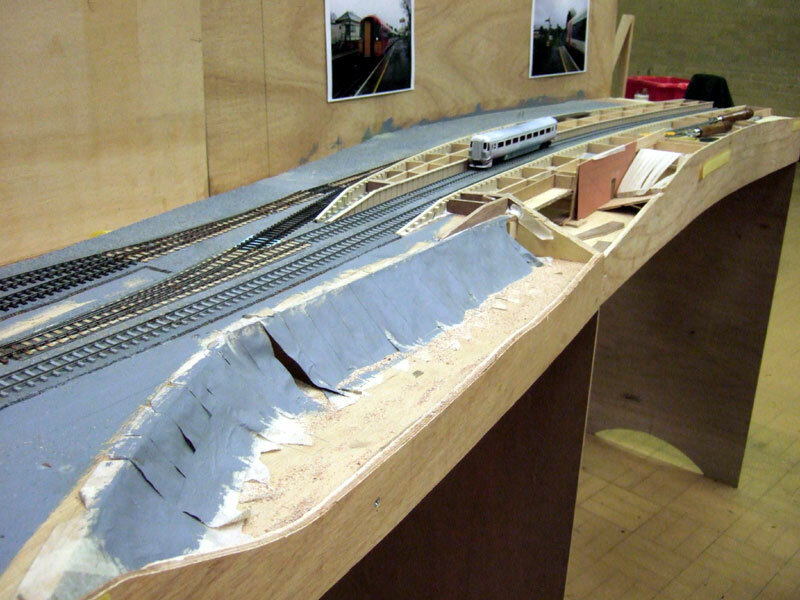 The embankment that is emerging from the front of the layout is the remains of the original line, that came into Hamworthy from 'Castlemans corkscrew' and which joined with the S&D line at Broadstone. The view towards London, showing the construction of the platforms. 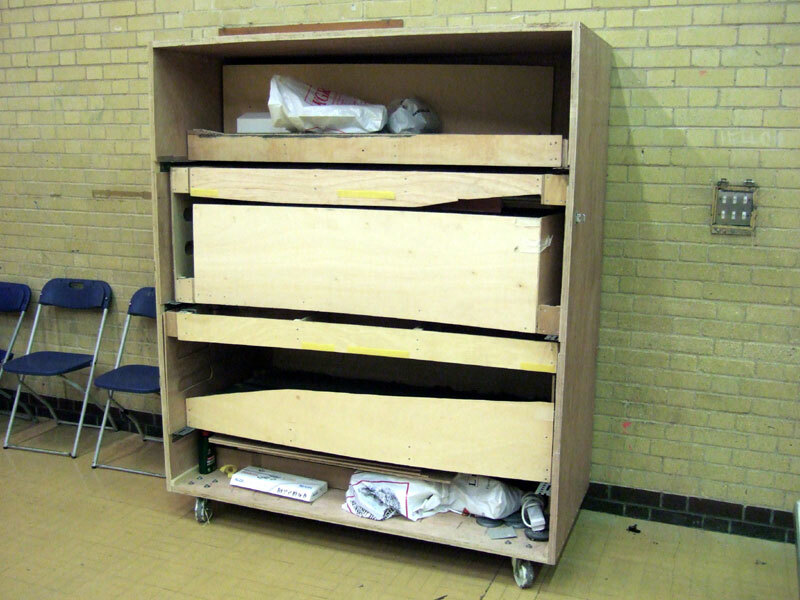 This is hopw the layout is stored between club meetings, packed face to face, and in a wooden crate. Hampton Court MRS meets every Sunday evening between 8pm and 10.30 at the Tolworth Recreation Centre, Fullers Way North, Tolworth. If any RMwebber wants a look in the flesh, you are more than welcome to come along one Sunday. We are always open to new members, and with a few more active, progress would be a lot quicker! I'm very impressed with the method of storage - ingenious use of space, and I guess it makes it quite mobile too. I presume the whole lot could be easily wheeled onto the tail lift of a luton body transit and then wheeled easily around at exhibitions too? Unfortunately it was not a station I ever photographed really, so I wouldn't be much help with details. You could do, and we did once take one of the other layouts out that way, but you do carry quite a lot of dead weight around, and I dread to think what would happen if it started to move whilst on the tail lift! The case is actually significantly over-engineered, it should have only been 1/2" ply, but due to a breakdown in comunications it ended up in 1 inch ply - it weighs far too much. Our other boxes tend to be a wooden frame with only a thin ply skin. Good choice for a model. Nice to see the reverse curves through the station modelled so well. This is a project I will enjoy following as I used to spend school holidays in Hamworthy when I was younger and especially remember watching the freight workings on the Ham goods from the level crossing alongside Ham park. I was only 8 back in 1988 but I can remember the 37's in metals livery working the import steel trains with the BDA's and JXA's in tow. The time period you have chosen is also very good as I remember the cross country trains to Poole with 47's and Mk 11's with the odd MK1 restaurant and BG thrown in were extended to Weymouth on Summer Saturdays and the LPG block tank train will also make an interesting train working through. Will you be modelling these tanks and the covered steel wagons as they will make interesting projects in their own right and one I would be interested to see how you tackle. 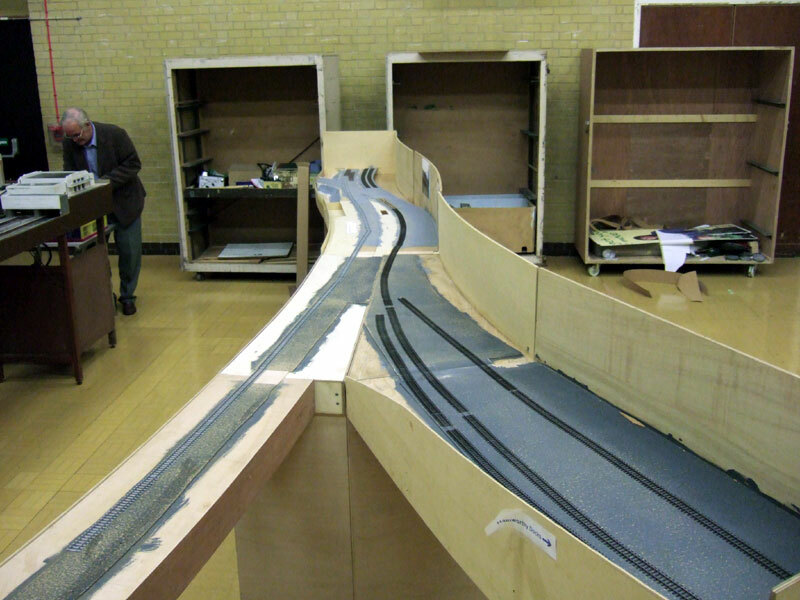 Will you also be including the 2 red brick arches over the main road the runs right down through the entire length of Hamworthy as well as they would make a really interesting feature on the layout as well although not so easy to model with the curved brick runs under the arches and the 2nd one is at an anle where the line curved off to Broadstone. The baseboards were a bit of a challenge, they took 18months of sporadic activity to get sorted out, and we have only just started to think about finishing the job with 3 fiddleyards. 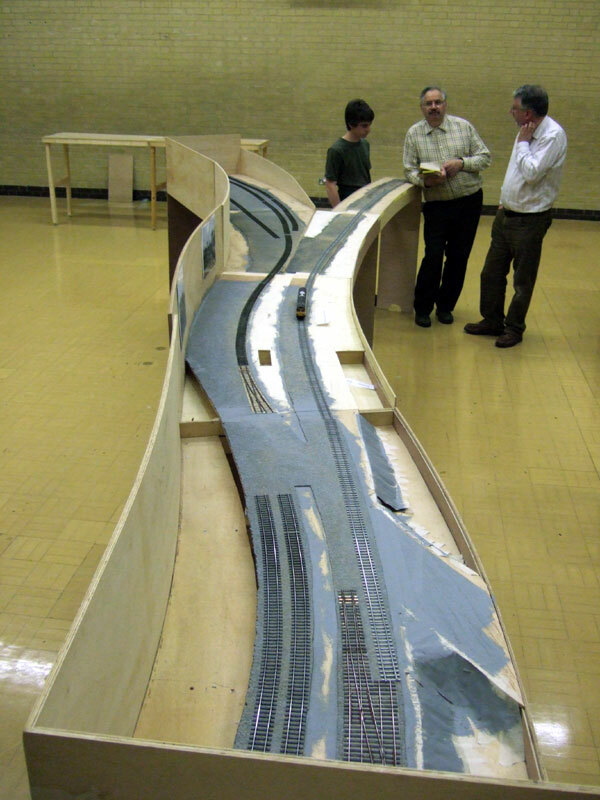 We could of course have straightened it all out, but it would have lost all the character, despite appearances, it is of course, in model railway terms, almost straight, the tightest curvature is 2.5m radius around the back of the platforms, the mainline is >5m radius going up to about 10m as it reaches the Weymouth end! I'm going to have a go at the Powell Duffrin coil hoods, but not just yet. As well as the Hamworthy Cardif Tidal steel traffic there was also a weekly speedlink that did, Eastleigh>Hamworthy Goods (collect or deliver steel)(rr)> Poole yard(rr) > Furzebrook (clay tigers)(rr) > Wareham(rr)> Wool (MOD traffic, later fertiliser)(rr)>Eastleigh. The gas tanks might only be a short rake as we won't have very long fiddleyards, which probably also rules out the cross country's. There was also a variety of nuclear flask traffic to and from Winfrith, I understand that they tested the flasks there, so almost any type of flask wagon could appear on the service. Sadly there isn't enough room at the London end to get the bridges in, and the embankment isn't quite high enough, we have had to compress that end quite a lot. For a station with platforms only barely long enough to fit a 5 car Wessex, the total length of layout is huge! 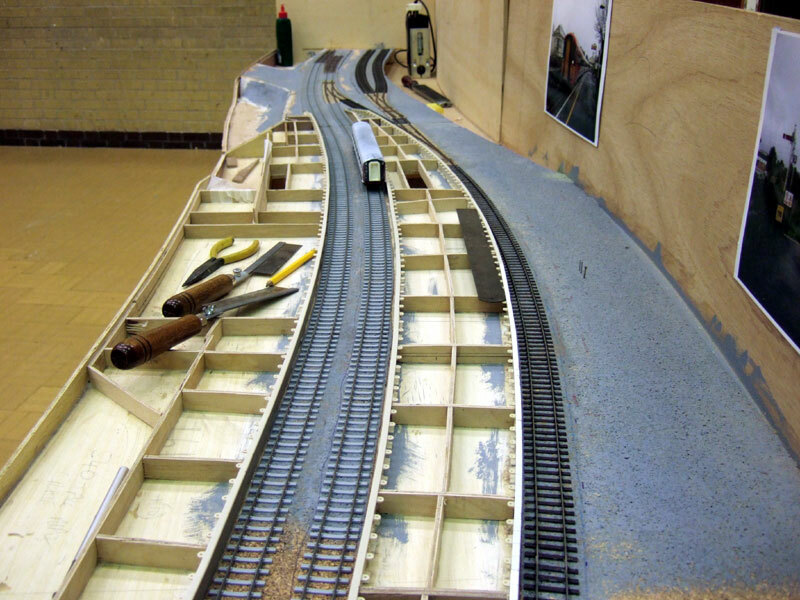 Great looking layout Jon ..use to work the LPGs to Furz and the steel and stone ect to Hamworthy, I have some pics If you want..cheers Keith. (YVM) Heres a pic of Ham box ..
Great choice of location, coming from Poole I know it well. Its a shame the sleeper didn't go that far, would have been a nice relatively small train service to model. I shall be following this with interest. Dunno if this has been mentioned before, but the other site says this is 00. Well it had me fooled - the shots on here I thought were EM or more likely P4. Really superb - the flowing, real world lines and so forth. Inspirationasl stuff/ I'm just disappointed I live too far away to join in! on when I see Colin in a week or so. That omision wasn't entirely accidental, we have found that people see hand built track and make an assumption that isn't right. My view is that if you hgave to ask, why would it matter. although I'm sure those who are practicing in EM/P4 are more likely to notice..
Thanls Paul, that's a great connection, which will make posting progress on RMweb worthwhile! Hamworthy has been a bit moribund over the last few months, I've been reluctant to install the point rodding until we have a lever frame to work it from, and are certain whether we need a pull, or a push for activation. Until the point rodding is laid out we won't really know where the wiring to switch the frog polarity needs to go, and without all that we won't know which areas underneath are available to add bracing between baseboard and legs. Fortunately at Railwells I acquired the requisite lever frame (well one of the two required) from the Scalefour Society stores, and over last week I've built it. After Sunday nights club meeting I brought the baseboard home to have a concentrated session setting all of the rodding runs, the results of my efforts you see here. All of the points are attached to 'bluepoint' mechanical actuators, and then model aircraft polyethylene wire-in-tube and a few cranks have coupled them all up. The lever frame will sit in the arc of the backscene so that it doesn't protrude too far, however this won't give enough finger room to pull the levers, so it will sit on a subframe that can be slid about an inch away from the backscene. The only way I can achieve that is by using the flexible tubing, which can flex to accommodate that movement (just like the brakes on a bicycle the actuation only requires a differential movement between inner rod and outer sleeve). There are 5 turnouts on this board, two form a crossover (1 lever), two more are a point/trap pair, that will also co-act with a single tortoise on the neighbouring baseboard (1 lever), and there is a single point giving the coice between two sidings (1 lever) this leaves me two spare, which will probably control the isolation on the main running lines through the station. The second board has a similar number of points to control, but I haven't calculated which will share a lever. Why mechanical actuation? two reasons, firstly HCMRS's track record with electricity is truely dreadful. Secondly the prototype is still controlled by levers from the signalbox on platform 2, so it seemed appropriate. Please post some pictures of the sliding frame when you install it as I'm intrigued. Just caught up with this - fascinating project. I'll be watching with interest. Lovely to see the 442 units modelled, too. So this is the Scalefour Society lever frame, in its 'stored' position it just about fits without protruding beyond the backscene at the outer end - the reason thats important is so that the baseboard can be laid on the backscene if reqired. The intent is that there will be a spar that crosses the back, more or less where the ruler is in this photo. Obviously there is no room for fingers to get behind the lever to operate them with the frame in this position. Here the frame is in the operational position. it only has to move about an inch. This is whats going on underneath, the two photos show the stored and operational positions. The final conections between rods and levers have not yet been made, they will probably happen a bit lower down, but its better to have too much and trim back again, than cut them too short! Thanks Jon, I assume they are all rc servo cranks too? Wrong scale for me but very much the right line. Looking forward to seeing progress with this layout greatly! Unlikely - the Weymouth electrification was done on the cheap (even cheaper than the original Bournemouth electrification) and the power supply was so inadequate that class 442s were only permitted as single units, so 10-car formations beyond Branksome were banned. I believe that's still the case for the 444s. I'm not sure where the electrical limit for higher power is, but 10-car formations were/are allowed to Poole so that longer train services could run from there instead of Bournemouth. I think it was primarily done to extend the semi-fast service to Poole. When the semi-fast service started running from Wareham, I think it had to be limited to a single unit, but others here will have more accurate information than me. 10 442's certainly ran from Poole and the Desiros still do as I use them to London occasionally. They start at Poole though for the peak services and come out of the sidings, they don't attach in the platforms which I suspect is due to the sharp curve, (certainly you are on a hiding to nothing trying to attach 159's on a curve). West of Poole there's not much call for the capacity so most trains split at Bournemouth as that's where the drivers depot is so there's someone to take the other unit away. So I think 5 cars 442's would be the norm at Hamworthy though the slammers ran in multiple to Weymouth. They did beef up the power supply a few years ago, when new facilities on the up side at the western end of the Bourne Valley viaduct near Branksome, were constructed. x2 Cl.442 did and x2 Cl.444 and Cl.450s do run into the carriage sdgs west of Poole where, as a previous post had said, any uncoupling takes place. I don't ever recall seeing them in multiple beyond that point though.